As the first darker beer that wasn’t a BrewSmith kit and the first 23 litre batch that wasn’t a lager, there was a lot riding on this being a success. I think we can say the Dead Guy Dark Ale met the challenge. This is a dark ale. Not a brown and not a porter. It’s important to make the distinction because they are trying to do different things. 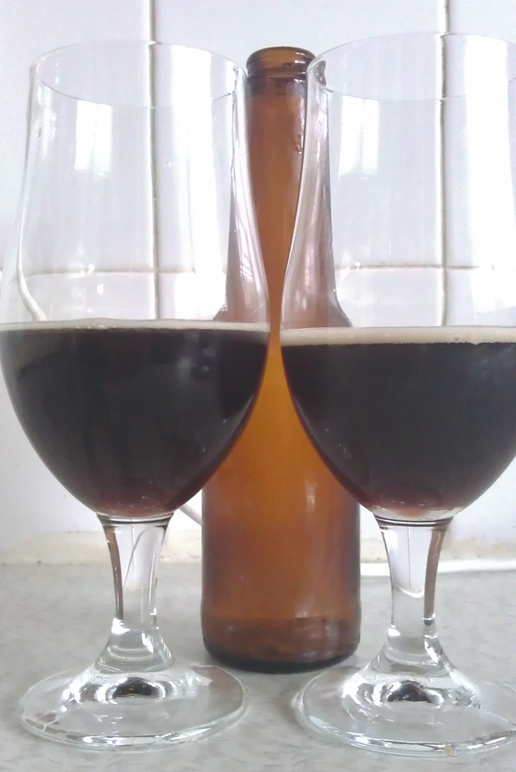 Dark ales are generally the area between Brown Ales and Porters. Not as sweet/nutty/spicy as brown and lighter than a porter. Up front there’s a dark sweetness aroma. Sort of like a caramelised sugar smell. It’s saying “hey, I’m pretty tasty so come and try”. Lots of dark malt flavours. Not a huge body or overwhelming. There’s a slight sweetness across the beer which works well. Bit of smoke and darkness up front. The dark malt builds in the middle and then lasts quite a bit. Really enjoy this. Would be matched with any meal that would be defined as “hearty”. Meat pie, beef casserole, thick spaghetti Bolognese, lamb roast, jacket potato, …you get the idea. Because this is lighter than a porter it’s easy to drink. Works well as a food beer or to knock back at a party. I’m loving this beer! Dark and brown ales are amongst my favourite as a session beer and this one ticks all the boxes. I’m going to make this again.